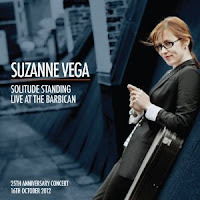 Suzanne Vega celebrated the 25th anniversary of her album Solitude Standing with a live concert at London's Barbican on October 16, 2012. The live recording was originally available through the Concerts Live site, but will now be given a general release in Europe on February 18. The concert is broken into two halves. The first is the anniversary performance of Solitude Standing in its entirety. The second half was performances of some of Vega's best known music from the other albums released throughout her career. At this time, there are no announcements of a U.S. release; however, the album should be available through Amazon as an import.